According to eMarketer’s latest forecasts, worldwide business to customer (B2C) eCommerce sales will increase by 20.1% this year to reach EUR 1.1 trillion. Growth comes primarily from rapidly expanding online and mobile user bases in emerging markets, increases in mCommerce sales and advanced shipping and payment options. 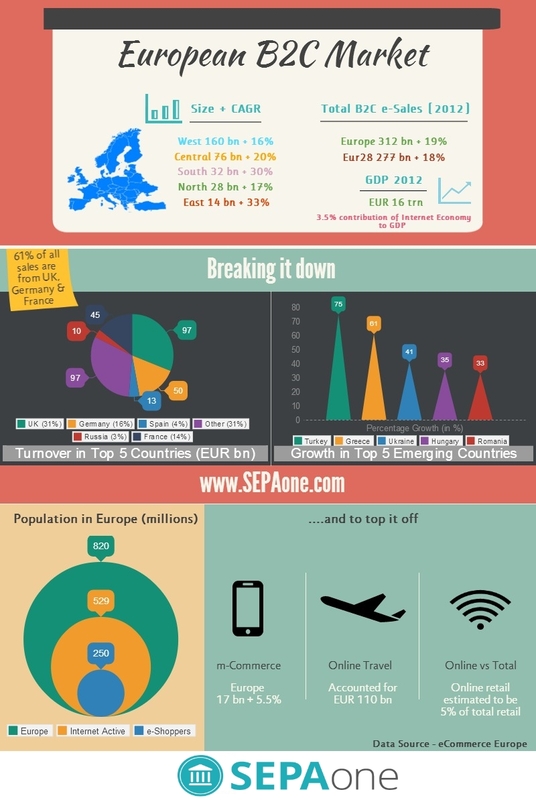 In 2012, Europe accounted for close to EUR 312 Billion in eCommerce sales. The Western European region, including Belgium, France, Ireland, Luxembourg , The Netherlands and the UK, was in the 1st position for e-commerce size, with a 51% European market share. The total B2C eCommerce sales of W.Europe closed at EUR 160 Billion, a 20% growth compared to 2011. The size of the market and the number of e-shoppers provide a massive incentive for businesses to implement SEPA Direct Debit as one of their payment models. The simplicity and security of this payment system give customers a great user experience while shopping; one of the key factors to acquire repeat customers. ← What are the advantages of using SEPAone?